Will the Clipper race ever come back to California? Meaning the Clipper Round the World, whose organizers went to great lengths to bring their event to a place that is usually ignored by long-distance racers because it’s just way, way, way off the route to anywhere. Whose fleet is now about halfway across the Pacific on leg five from Qingdao and getting hammered (really hammered) with a couple weeks of sailing remaining to cover the miles to San Francisco. Who found a sponsor for every one of their ten entries except the one named—California. I’ll ask my question when they get here. This is an event I’ve largely ignored over the years, not because it represents anything less than a great adventure for the participants, but because it’s hard to embrace a pay-to-play amateur event (that reproduces itself every two years) in the same way that I embrace the Volvo Ocean Race, for example. But I have to admit, the Clipper Round the World makes a compelling case for itself. Would-be crew can sign up for one leg, multiple legs, or a circumnavigation. 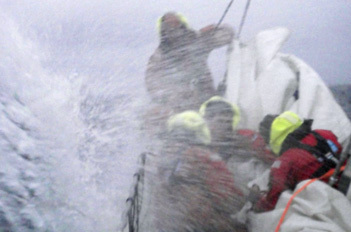 They receive intense training ahead of departure from the UK, where Sir Robin Knox-Johnston’s Clipper Ventures is based. And long before it’s over, they are seasoned ocean hands. They don’t rock the world of sailing, but from the inside looking out, the competition and the experience are as profound as anything that could happen to anyone at sea. I will also admit that, with the fleet en route to the Golden Gate and my own shores, I’m hooked. If nothing else, I stand in wondering admiration of the race organizers who make this thing happen and keep it working in the face of one logistical nightmare after another. There was, for example, the leg from Singapore up to Qingdao, where Cork went aground and was abandoned, and Team Finland was dismasted. So they chartered a similar-enough boat in Antigua that is being prepped and delivered to Panama to join the fleet there. Meanwhile, the crew of Cork is re-distributed among the remaining nine boats. A mast was delivered to Qingdao, where it was installed in Team Finland, which left for San Francisco two weeks behind the fleet. And then there was a skipper to medivac. Ten days out of Qingdao, in heavy weather, Hull & Humber skipper Piers Dudin was wave-washed down the deck and came away with a fractured leg. He was two days later transferred to a Japanese Coast Guard boat, and pro skipper Brendan Hall was transferred to Hull & Humber from Spirit of Australia, where the highly-experienced Bob Bell took over as captain. That’s a bit of orchestration, eh? Hall describes his transfer: “I was wearing a diving dry suit and my inflated life jacket. Hull & Humber heaved us a rope. I tied it to myself, jumped in, and they pulled me and my kit bag over to their boat and winched me up on deck.” Just another day at sea. Japan was a lot closer than California at that point, but the weather behind argued against turning around. New Cork skipper Hannah Jenner will meet her crew in San Francisco, then again in Panama where the fleet will transit to the Caribbean side and Cork will resume racing as a team. Jenner skippered a boat in the 2007-08 race and is a veteran of the doublehanded Fastnet and Open 60 transatlantic competition. Having a top level professional in the role of captain is key to the success of the Clipper race, but it takes a team to get these boats across an ocean. Pete Stirling, skipper of Jamaica Lightning Bolt, recently wrote: “Strong westerly winds have provided fast downwind sailing. The weather, however, is still quite changeable with occasional rain squalls. These are particularly dangerous at night as you can’t see them coming. Last night we got caught unawares by a squall that was moving very quickly. I leapt on the wheel and instructed the on watch crew to get the Yankee 2 down as fast as possible and put a second reef in the mainsail. From where I stood behind the wheel, watching the crew working on the foredeck, I had a horrible feeling things were about to go horribly wrong. 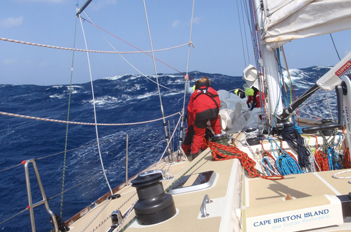 We had 20 knots of boat speed and 40 knots of apparent wind meaning 60 knots of true wind. We were massively over-pressed and on the edge of control. Much of the fleet is experiencing rain, and there are low pressure systems threatening more high winds for relevant parts of the “Pacific,” so there is plenty of hard sailing to come. Edinburgh Inspiring Capital gets to play while nursing a bent spreader for the next few thousand miles. Lay that thought on your pillow tonight. 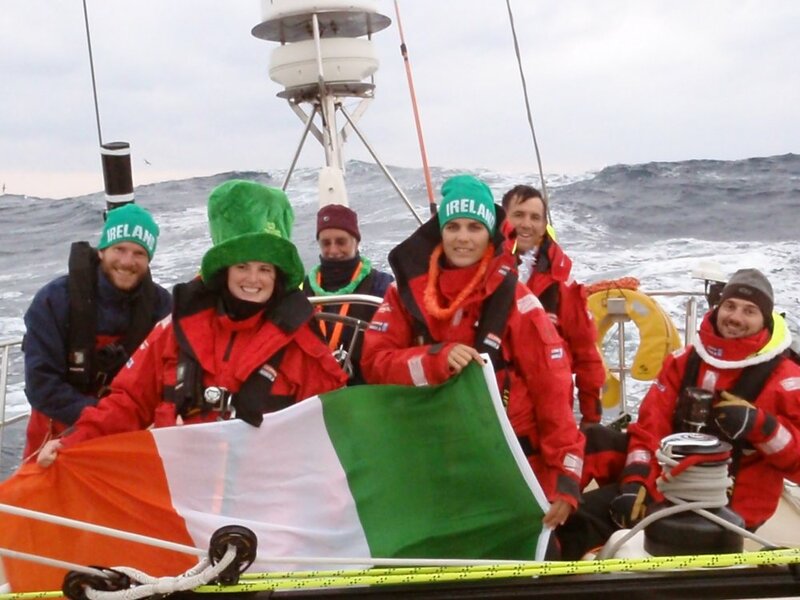 And before we go, here’s a look at the Irish spirit aboard California . . .